Often our pro tennis Player of the Year is that year's male or female singles champion. But sometimes a single achievement seems of such lustre and distinction that it overrides all 12-month achievements. Thus in 2001 we chose a player of modest ranking, Nicolas Escude, in order to honor his remarkable role in France's successful quest for the Davis Cup. Last year's winner, Roger Federer, finished the year second in the official rankings, but his near-perfection at Wimbledon 2003 seemed a surpassing accomplishment. In 1998 we chose Jacco Eltingh for his magnificent year-long performance in doubles. Only one individual is chosen each year whether male or female. Year 2004 produced plenty of high drama in women's tennis, featuring a revolutionary change at the top levels of the game. Of the Top Six in the WTA rankings for 2003, only Davenport and Mauresmo were able to repeat in 2004. The other four members of that elite group (Serena, Capriati, and the Belgian stars) lost their places to four rising Russian players. The Russian Revolution largely took place after mid-May, and was most evident at the later Slams. The Old Guard began the year well. Justine Henin-Hardenne of Belgium seemed ready to preserve her #1 ranking by winning Australian Open in January, defeating countrywoman Clijsters in a three-set final. Six of the year's ten Tier One tournaments then followed, largely dominated by the 2003 Big Six. Lindsay Davenport won the Pan-Pacific in Tokyo, Henin-Hardenne took Indian Wells, Serena won at Key Biscayne. Venus won at Charleston on clay after Serena withdrew with knee trouble, and Amelie Mauresmo won the German and Italian Opens. Garros 2004 signalled the upward break-through of the improving Russians. With Justine knocked out early amid recurring weakness from a viral ailment and with Clijsters absent with wrist trouble, Russian star Myskina, 22, was dazzling in winning the world's leading clay event. Her final-round opponent was another Russian, Dementieva, 22. Kuznetsova, then 18, and Sharapova, 17, next won the grass-court tune-ups at Birmingham and Eastboune, respectively, accurately foreshadowing Russian success at Wimbledon. Maria Sharapova then captured that event, tennis's grandest, behind firm hitting, excellent court mobility, and nerves of steel. The Old Guard recovered somewhat the summer. The Acura Classic in San Diego became a Tier One for the first time, and the event was won by Davenport in a final-round demolition of Myskina. August brought the Canadian Open in Montreal, won by Mauresmo, followed by the Olympics in Athens, won by Henin-Hardenne, who defeated Myskina in a split-set semi and Mauresmo in a straight-set final. But the U.S. Open produced another all-Russian final, Kuznetsova, having turned 19, defeating Dementieva. Two more Tier Ones remained--in Moscow and in Zurich, both indoors. Myskina defeated Dementieva in the Kremlin final, and Australian star Alicia Molik--age 23 and nearly six feet tall--defeated Sharapova in four sets in Zurich. The year-ending championships indoors in Los Angeles went to Sharapova, who showed severe hitting power throughout the event, beautifully complementing her excellent court movement. Her final-round victim was Serena, whose serve was crippled at the end because of an abdominal strain. As expected, the host Russians won Fed Cup in late November, indoors in Moscow. Myskina won two meaningful singles matches in the final-round victory over the defending champion French team, which lacked both Pierce and Mauresmo. Finishing first in the WTA points race was Lindsay Davenport, just ahead of Mauresmo. But as its singles champion for the year, International Tennis Federation instead picked Myskina, weighing in Anastasia's fine Fed Cup record. Second on the WTA list after Davenport was Mauresmo, and four Russian stars followed--Myskina, Kuznetsova, Sharapova, and Dementieva, in that order. The four newcomers to the Big Six averaged a total of 21 tournaments played during the year, while the four Old Guard departees, all of them troubled by injuries, on average played only 10. Finishing first in the WTA doubles rankings and also named doubles champions by ITF, was the delightful pair Ruano Pascual and Suarez, winners of three of the year's four Slams. Several top singles artists also achieved significant doubles success, including Kuznetsova, who with Likhovsteva finished at #4 in the final rankings of doubles pairs, and Myskina, who with Zvonareva finished #8. Our nominee for Player of Year 2004 from the women's side is Sharapova, whose overriding credential is her superb achievement and astonishing poise in capturing Wimbledon. Myskina's overall achievements and perhaps Kuznetsova's too are a shade stronger than Maria's, though all three lost fairly often to lower-ranked players. I disliked Anastasia's resentful, seemingly petulant public comments about Maria and her father after Fed Cup. Whether or not Sharapova in future years fulfills the seeming unlimited promise of her talent, courage, and power of concentration, her magnificent demonstration of these qualities at so young an age will remain. Looking ahead to 2005 in women's tennis, the largest uncertainties are whether members of the recent Old Guard can regain full physical health. Even Davenport and Mauresmo, who stayed in the Top Six, missed some of 2004 with injuries. Davenport will reach 29 during 2005 and is talking of retirement. A strong Russian presence at the upper level is a certainty. Indeed, three Russians not yet mentioned here--Zvonareva, Petrova, and Bovina--finished not far below the 2004 leaders. Finally, Molik of Australia and perhaps hard-hitting Sprem of Croatia, 20, may be ready to move up. Golovin, who was born in Moscow but played for France in the 2004 Cup final at age 16, requires watching. Acknowledging the achievements of Sharapova and the other leading women, there is really only one possible choice for our 2004 prime honor. Roger Federer won three of the year's male Slams, an achievement not attained by Sampras or Agassi or anyone else since Wilander in 1988. The Swiss superstar stumbled only at Garros, losing in the third round to three-time former champion Kuerten. Roger also won three Masters Series tournaments during 2004 including the German Open on clay, and he also won the year-end Masters Cup in Houston. He performed heroically in Davis Cup, winning all four of his singles matches, all of them meaningful. The Swiss team was unable to win any other singles matches, but Federer won the doubles with partner Allegro against the Romanians, resulting in a 3-2 team win for Switzerland, and lost to the French pair Escude-Llodra, resulting in a 3-2 win for France and ending Swiss Cup hopes for 2004. In recording his triumphs Roger brought an on-court game that sometimes seemed to appproach perfection. He moves over the court swiftly and easily. He is capable of sustained power, smoothly delivered and, when he is at his best, irresistable by any other pro. Against perhaps his most dangerous foe, Andy Roddick, he has repeatedly shown the ability to sap the greatness from the American's serve, returning safely and consistently, and to neutralize Andy's net approaches with deceptive and accurate passing shots made possible by his court mobility. His backhand is a picture to watch, and though he seldom comes regularly to net, the world saw his ability to do so at Wimbledon 2003. His public image is sterling, his representation of our sport on-court and off absolutely unblemished. Can Roger capture all four Slams in 2005? Probably not, as there are many strong opponents in his path. But he will certainly be the favorite to win in Australia, Wimbledon, and New York, and he will probably win one or two of these. Garros is a different story, where the clay game will offer an additional group of dangerous opponents. But Roger's mobility, variety in stroke-making, and intelligence suggests that a Garros championship is possible. In winning the German last year, for example, Roger defeated in turn Moya, Hewitt, and Coria. Gaston Gaudio, unseeded, won Garros, recovering from two sets down to defeat a cramping Coria in the final. Otherwise, the year's top clay-courters were Coria and Moya, winners at Monte Carlo and Rome, respectively. Nicolas Massu won the Olympics singles and, with countryman Gonzalez, also won the doubles, thereby producing an unexpected Chilean sweep. Rafael Nadal, then 17, won the fifth and deciding rubber in Spain's first-round Davis Cup victory indoors over host team Slovak Republic. Nadal also contributed a critical win over Andy Roddick in the Cup final round. Moya added two victories to complete Spain's triumph. Andy Roddick finished second to Federer in the year's points standings. Andy won Key Biscayne, was runner-up at Wimbledon, and showed improved net-attacking skills throughout the year. Marat Safin ended the year strongly, winning the Madrid and Paris indoors and finishing fourth in the points race, behind third-place Hewitt. The champion doubles pair was the veteran combination Knowles-Nestor. The Bryan twins won four Davis Cup doubles matches for U.S. without loss. 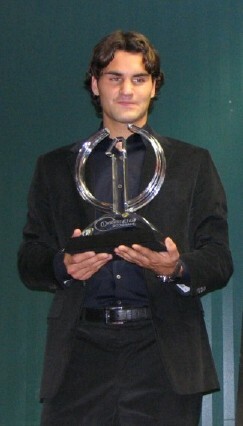 But without reservation, the incomparable Federer stands as our Tennis Server Player of the Year for 2004. The reality of the Russian rise in women's tennis was indisputable, punctuated by the Fed Cup triumph. Meanwhile on the men's side, the Russians were behind the U.S. and Spain both in Davis Cup and in the performance of individuals in tournaments. But despite the retirement of Kafelnikov, the Russian lineup of male pros, all approaching prime age, showed clear upswing. Safin, still just 24, again flashed his vast promise at #4, and Youzhny, 23, finished the year at #16, up from #42. Davydenko, 23, also climbed, finishing #28. Igor Andreev, age 21, broke into the Top Fifty at #49, and he defeated Srichaphan in Russia's successful bid to avoid Cup relegation in September. The dominance of the Russians in women's tennis and the rising trend of the Russian men support our selection of Russia as Pro Tennis Nation of the Year for 2004. Best wishes to all for another wonderful tennis year.